First appearance: Battle 1 Age: 17 Birthday: January 14 Type: Dou Type: Katsujin Ken Martial Arts: Furinji Style Martial Arts Miu Furinji is a 17-year-old girl who attends the same school as Kenichi (as well several other prominent characters) and is currently in her second year. She is the granddaughter of Hayato Furinji and the daughter of Saiga Furinji the leaders of Ryozanpaku and Yami's One Shadow Nine Fists respectively. It is unknown how or when Miu came into Hayato's care but she has been with him since she was at least 6-years-old. It was in these early years of her life that Miu learned martial arts from her grandfather and also accompanied him on his missions to bring about peace. Before Miu transferred to Kouryou she attended a school that was apparently quite famous but didn't fit in because all the girls in the school were jealous of her looks. It is because of this that Miu attempted to moderate her appearance by fashioning her hair into a plain-looking braid and began to wear glasses. Though she kept this facade going well into her second year she eventually discarded them. Despite being attractive, athletic, kind, and humble, Miu is very socially inept to the point of having no friends before meeting Kenichi and has practically no social life. The reason for Miu's immense amount of social ineptness stems from her upbringing in which she never had any time to make friends and also from her home life in which she is practically a live-in maid. 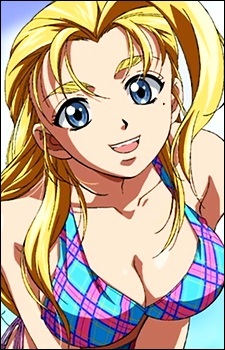 In spite of this however Miu has managed to make quite a few friends over the course of the series due to her kind and friendly nature as well as some help from Kenichi. Miu has a great fondness of kittens and becomes openly hostile towards anyone who harms one and even once tortured Kenichi because he ruined an opportunity for her to have one. Miu has consistently proven herself throughout the series to be an immensely skilled fighter. Having been trained by her grandfather since she was very young as well as facing much danger along the way her skills have been honed to the point where she will reflexively throw anyone who sneaks up behind her. Though her fighting style has not been named she makes heavy use of kicks as well as acrobatics. While her exact level of skill is unknown, Kenichi has never once been able to hit her in a sparring match (though his vow to never hit women much less Miu may contribute to this).